If you’re a chronic smoker you’ve probably tried quitting those cancer sticks a few times now to no avail. It can be an incredibly tough journey to being smoke-free but there’s help at hand – literally. 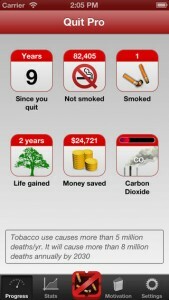 There are a number of quit smoking applications for the mobile smartphone that can help you along the way. Take Quit Pro, developed by Singapore-based Bitsmedia, for example. The mobile-based application – on both iOS and Android – lets an individual track and manage their way towards quitting smoking. Users can use the application to help them track every cigarette they smoke (“checking in” a smoke, if you will), or even the ones they successfully resisted. It may sound a bit frivolous, until you realize that plotting such data allows you to track the moments of the day or week when you’re most tempted to smoke. You can even track and identify triggers – covering over 20 moods and situations – that make you want to smoke the most, and even the places where you usually indulge in a cigarette. By by tracing and tabulating such data, you’re better placed to help yourself kick the habit. And if you’re the sort who’d like some moral support along the way, Quit Pro employs the usual social sharing functions to broadcast your progress to your social networks.There are a litany of motivational quotes to give yourself a morale boost. According to its developer, Quit Pro has already helped over 130,000 smokers kick the habit. If quitting smoking is on your list of New Year resolutions, quit smoking apps such as Quit Pro may be able to help you achieve that target. If all else fails, you can try portable vaporizers for the path of quitting smoking tobacco since it’s a healthier alternative (check out this site).